Make these Oatmeal Fudge Bars for a treat the entire family will love. 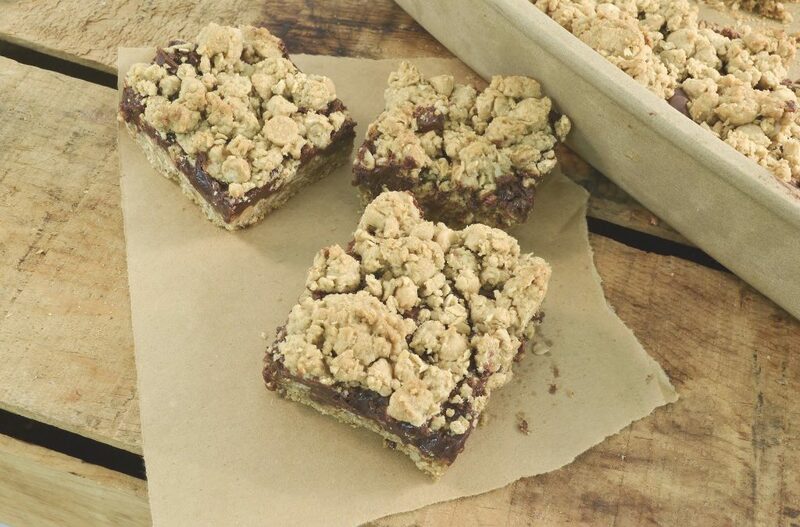 Tasty oatmeal and delectable fudge come together for a bar that you’ll want to make again and again! Preheated oven to 350 degrees. 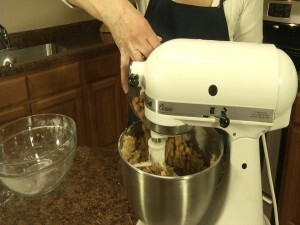 In a mixer, place 2 cups packed brown sugar. Add 1 cup softened butter to mixture. Add 2 eggs to mixer. Add 1 tablespoon vanilla. Mix. 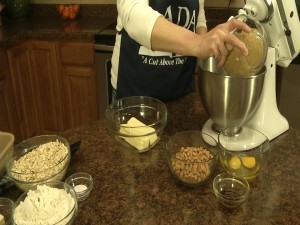 In a mixing bowl, place 3 cups old-fashioned oatmeal. 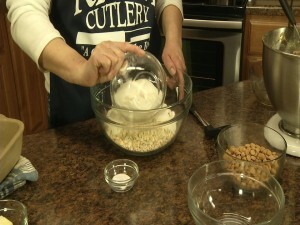 Add 2 1/2 cups all-purpose flour to oats. Add teaspoon baking soda and a teaspoon salt. Turn mixture on and slowly add oats mixture to egg-butter mixture. 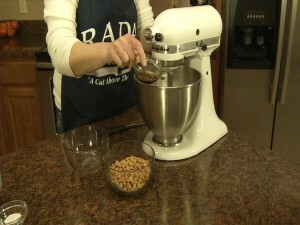 Add 2 cups peanut butter chips to mixer. Continue to mix until all is blended. In a medium-sized saucepan over heat, add 14 ounce can sweetened condensed milk. Add 2 cups semi-sweet chocolate chips. Stir until all is melted together. Remove from heat and stir some more. 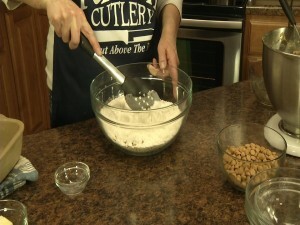 In a 9″ x 13″ pan, place mixture. Spread 2/3’s oats mixture evenly across pan. Pour fudge sauce across oats mixture. Spread remaining 1/3 oats mixture across top of fudge. Spread evenly. Bake at 350 degrees for 30 minutes. Remove from heat and allow to cool. 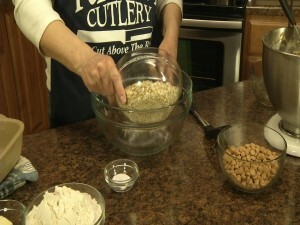 Serve and enjoy these easy oatmeal bars! 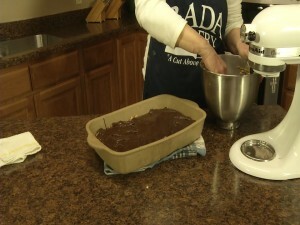 The Rada Rectangular Baker is a 9″ x 13″ pan you’ll never run out of recipes for! Made from a lead-free, proprietary clay mixture, this stone pan absorbs heat for an even baking temperature, ensuring a perfect cook every time. 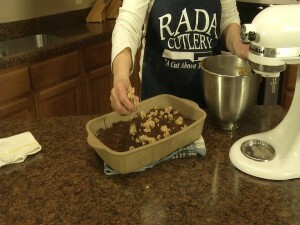 Like all Rada Cutlery products, the Rectangular Baker is made in the USA! 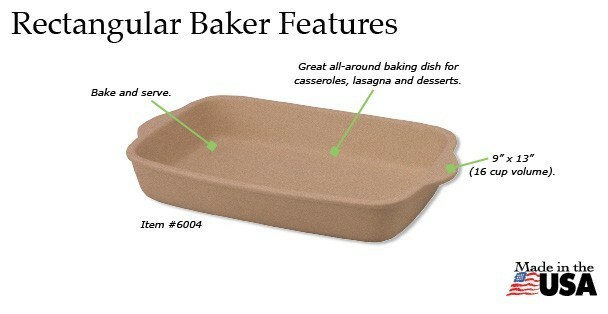 Our online Rada Kitchen Store has the Rectangular Baker ready for home delivery! The Perfect Non-Scratch Kitchen Utensil! 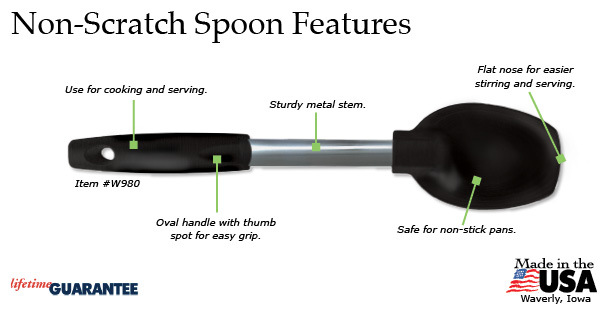 The Rada Non-Scratch Spoon is just what your kitchen needs! This great utensil features a sturdy metal stem that guarantees against bending, as well as a flat nose for easier stirring and serving. 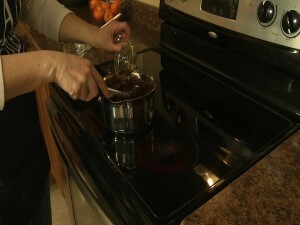 It’s made from a non-scratch material that is safe for use with non-stick pans. It’ll instantly become your go-to spoon in the kitchen! 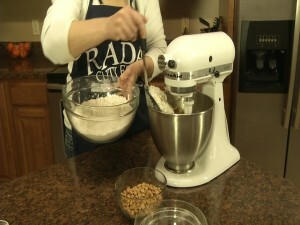 It is backed by a Lifetime Guarantee, and, like all Rada Cutlery products, is made in the USA. 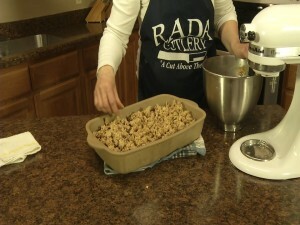 Visit our online Rada Kitchen Store to order your own Rada Non-Scratch Spoon! Baking soda is simply a chemical salt with a wide array of uses. One can use it for cooking, cleaning, in place of toothpaste, to deodorize, and more! 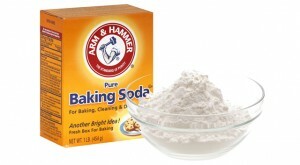 Visit AllYou.com for a list of 31 uses for baking soda! Rada Cutlery has been the partner of choice for countless nonprofit groups since 1948. 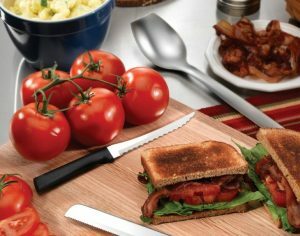 By partnering with Rada Cutlery, your fundraiser has advantages ranging from great customer service to fantastic kitchen products. 1. Incredible Customer Service – Fundraising groups are known to rave about the quality of Rada’s customer service. Our friendly, knowledgeable representatives are committed to helping each fundraiser be a success! 2. Stellar Products People Actually Want – Rada Cutlery offers cutlery, kitchen utensils, stoneware pans, cookbooks, and much more! All cutlery, utensils, and gift sets are backed by a Lifetime Guarantee, so supporters can buy and use with confidence. 3. 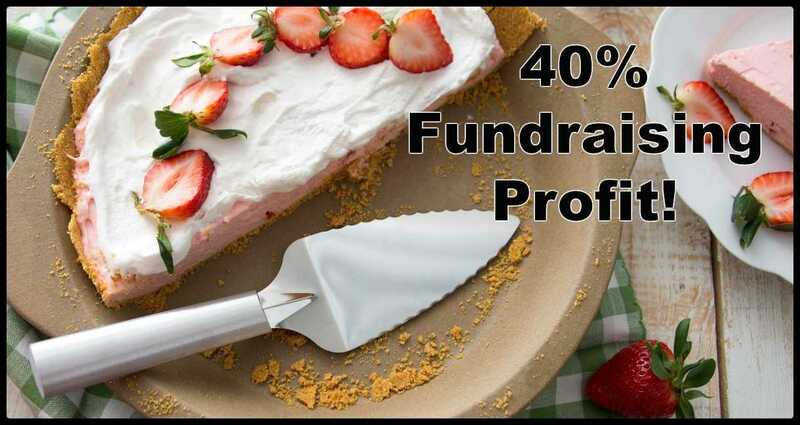 Enormous Profits on Sales – Rada Cutlery fundraisers give your group an amazing 40% average profit on items sold! That’s far more than most fundraisers. Your group’s efforts go further with Rada! 4. Three Effective Ways to Sell – A Rada fundraiser offers three powerful sales methods, each designed to maximize your group’s profits! Catalog sales is a tried-and-true method that allows your group to offer catalogs to friends, family, neighbors, and coworkers. Event sales feature a personal touch, taking advantage of friendly crowds and physical interaction with our stellar products. Online sales utilize the power of the Internet to allow fundraisers to make easy sales to supporters close and far. Use one, two, or all three methods to earn money for your cause! 5. USA-Made Cutlery – Every Rada product is made entirely in the USA. American workers craft each item with unmatched skill, making products your group and its supporters can be proud of. Stop by our website to learn more about how our employees’ skill and dedication make Rada products the best for your fundraiser! Click here or click on the catalog photo below to check out our fundraising catalog! Hi, welcome to the Rada Cutlery kitchen. 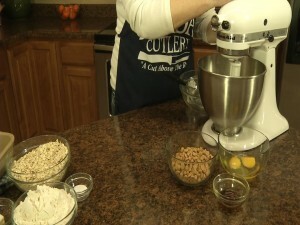 My name is Kristy, and today I’m sharing a recipe called Fudge Oatmeal Bars. This is a recipe I tried at a friend’s house and they’re really delicious. You’ll want to preheat your oven to 350 degrees. You’ll need a 9” by 13” pan. I’m using the Rada Cutlery Stoneware, which you don’t have to preseason. If you’re using a glass or metal pan, you’ll want to spray it good with seasoning. 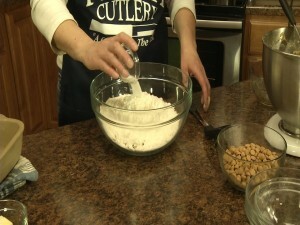 What we’re going to do is add 2 cups of brown sugar and a cup of butter to our mixer. This butter is softened, you’ll want to make sure it’s nice and soft. We’re just going to beat that until it’s well-blended and whipped up. So that is well-mixed and with a fluffy texture. We’re just going to beat in 2 eggs and a tablespoon of vanilla. Now, in a second bowl, we’re going to mix 3 cups of old-fashioned oatmeal. 2 ½ cups all-purpose flour. And then a teaspoon of baking soda and a teaspoon of salt. Just stir all that together. So now we’re going to get our beater going again and slowly add this mixture to our butter-egg mixture. 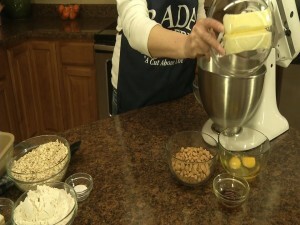 Now for this mixture, and this is optional, we’re going to add 2 cups of peanut butter chips. Now, in a medium-sized saucepan, for our fudge center we’re going to take a 14 ounce can of sweetened condensed milk, 2 cups of semi-sweet chocolate chips, and 3 tablespoons of butter. We’re going to just heat this until it’s all melted together and smooth. I’m using this Rada Non-Scratch Spoon. It’s got this nice, sturdy center so you won’t bend the spoon. It’s got a flat edge so you can scrape the bottom of the pan. And it won’t scratch the surface of your non-stick pans. So it’s all nice, creamy, and fudgy. Now we’re going to take it off the heat and add a tablespoon of vanilla. Mix that in well. Alright, now we can start assembling. Now we put 2/3’s of the oatmeal mixture in our pan. We’re just going to pat that down on the bottom. 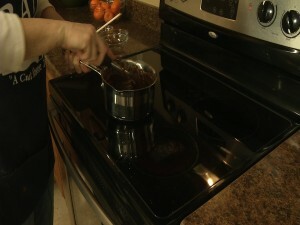 Now we pour on the fudge sauce. Make sure you get it evenly into the corners and the edges. 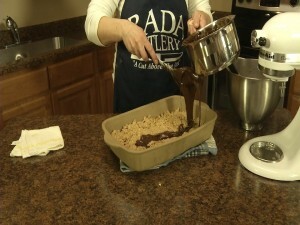 Now, with the remaining mixture, we put that mixture over that fudge. Now we’ll put it in that 350 degree oven for 30 minutes. So I took it out of the oven after 30 minutes. Let it cool slightly, if you can resist it! That’s baked oatmeal snack bars. A sure crowd pleaser. Enjoy!